As a mom of 3 and one on the way, I definitely can’t afford fancy skincare treatments. And since recently turning 35, I am all about skincare lately. So these affordable at home skincare tools will not only save you money but save your skin too. 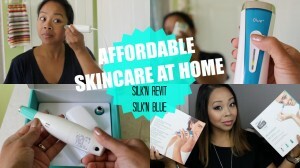 In this video I review and demo the Silk’n Revit Microderm & the Silk’n Blue Acne Solutions. Healthy skin does not have to cost you hundreds to thousands of dollars if you have these products accessible at home.